There’d been plenty of fast bikes prior to the Kawasaki two-stroke triples, of course, but while those were “introduced” in a conventional sense, the H1 and H2 were more accurately “unleashed on an unsuspecting public.” Never before had a bike’s ferocious engine so overwhelmed the limited chassis technology and brakes of the period in such a marketable way. By modern standards, and on paper, the power of the bigger 750 was fairly modest: just 75hp in a 450lb motorycle. But that was on paper. In reality, it wasn’t the quantity that made the power so terrifying, it was the sudden and violent two-stroke delivery. I’m sure you could ride your buddy’s around all day at low rpm and wonder what the fuss was all about. But whack that throttle open and hold it, hold it, and it would try to yank your arms out of their sockets. Which was also fine, until you tried to stop, or go around a corner. That lightswitch delivery combined with feeble brakes and a flexible frame that laughed in the face of words like “handling” and “stability.” This was a gas-sucking straight-line monster that suited American roads, the perfect Japanese alternative to big-displacement bikes like Kawasaki’s own Z1 that were so popular here during that period. Many of the Mach IV’s that show up here on eBay seem to be painted in a very nice blue color that suits the bike very well. But this original, unmolested bike is an appropriately 70s green that is far more subtle and effectively evokes that glorious period of polyester and 8-tracks. 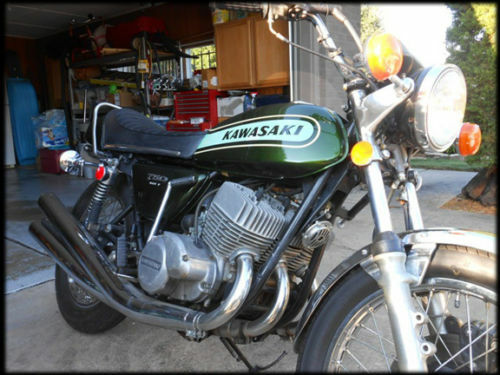 You are bidding on a 1974 Kawasaki H2, 750 Mach IV, often referred to as “THE WIDOW MAKER”. 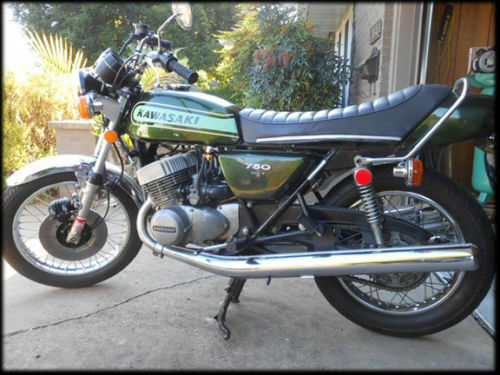 My brother Mike bought this bike new in 1975 and it has never been for sale since that time, he has decided to sell it now. 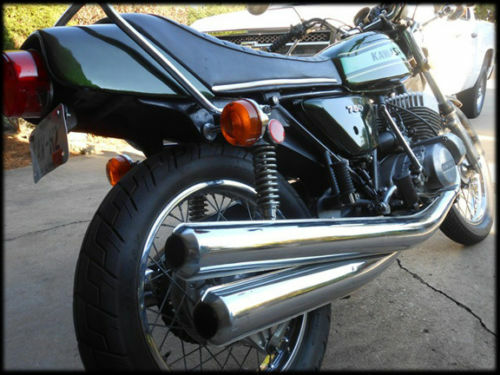 This is a one owner 1974 Kawasaki H2 Mach IV in excellent condition. This is an all original, ALWAYS GARAGED collectors piece that runs as designed. This is a survivor, it has never been painted, it has the original title, seat, original mufflers, owners manual, etc. The title is a MO title. In MO you can keep the old title for your collection and apply for your new title in your name. This bike even with the few dents and paint issues is as nice a bike as you will find that has never been restored and has been owned by only one person. 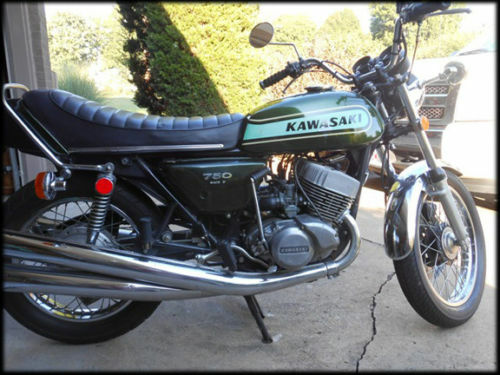 The bike was purchased new from Junior Mills Kawasaki in JoplinMO the first quarter of 1975. The original title says 4/10/1975. 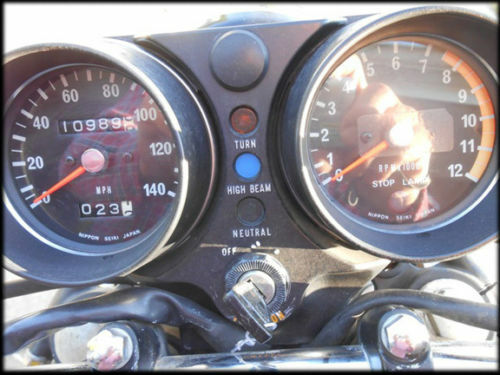 There are 11,000 original and accurate miles on this bike. The chain, sprocket, tires and some rubber parts were replaced approximately 1000 miles and 5 years ago. It is in excellent running condition and runs like it did when new. I have driven it about 100 miles in the last few days, it’s fun. If you have never driven one of these it is an experience. As they say, “it’s only original once” and that’s especially desirable when “original” is as nice as this one appears to be. While heavily patina’d bikes are all the rage these days, I’d personally rather ride around on something that cleans up nicely and shines a bit. 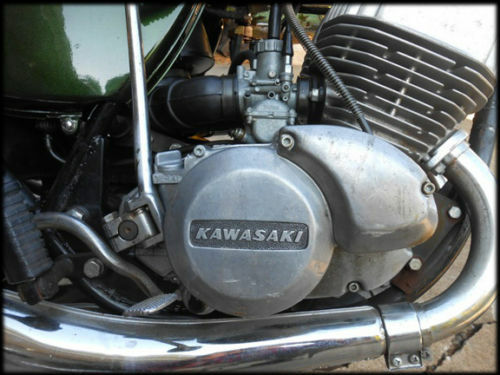 All of Kawasaki’s wild two-stroke triples are currently rocketing upwards in value, so at $6,500.00 with five days left on the auction, this one is obviously nowhere near its final price. “Ax Murderer”, that’s a refreshing new take on the over-used “widow-maker” moniker. The ’72-’73 model years were the blue ones. The ’74 was the 1st green color. “74 also had a longer swingarm to reduce the bikes urge to wheelie and generally help the handling. Unfortunately it lost a few horsepower trying to smooth the powerband somewhat. Yeah, well I try to keep things fresh! Actually, one of our readers emailed us to say that it was really the H1 500’s that were referred to as Widowmakers, and that the 750’s didn’t have nearly the same sort of on/off power delivery or evil reputation.